If Your Job Is To Attract Investments Here, Then 'Brexit' Could Hurt : Parallels The U.K. is the largest source of foreign investments in the U.S. Representatives of state economic development teams weigh in on the possible impact of a "Brexit" on business in their states. 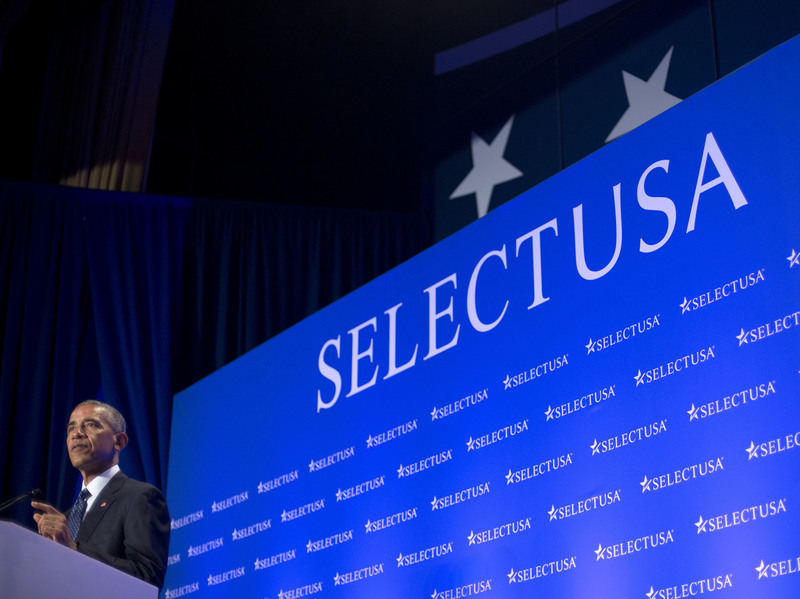 President Obama speaks at the SelectUSA Investment Summit in Washington, D.C., on Monday. Concerns about a possible "Brexit" were floating in the air as British investors met with state economic teams at the two-day summit. If you're on the economic development team for your state, you are happy — dancing-in-the-street happy — when you can attract foreign investments. You see a globalized world, bursting with opportunities, and you want your state to win a slice of that big pie. But this week, that expansive worldview is facing a test in the form of a referendum in the United Kingdom — the single largest foreign investor in the U.S. economy. Money from the U.K. makes up about 15 percent of all cumulative foreign direct investment holdings in this country. In other words, what happens in the U.K. can make a difference here. If British companies — say BP, HSBC Bank, GlaxoSmithKline, Unilever and Prudential — are making lots of money, then they can afford to invest more here. But the U.K.'s economic future may be changing, thanks to a decision coming on Thursday. Voters throughout the United Kingdom, including England, Wales, Scotland and Northern Ireland, will decide whether to stay in the European Union, a 28-member collection of countries with deep economic and regulatory ties. If voters say it's time to leave, then Britain will begin the process of severing many bonds with the European continent. People have been calling that outcome "Brexit." 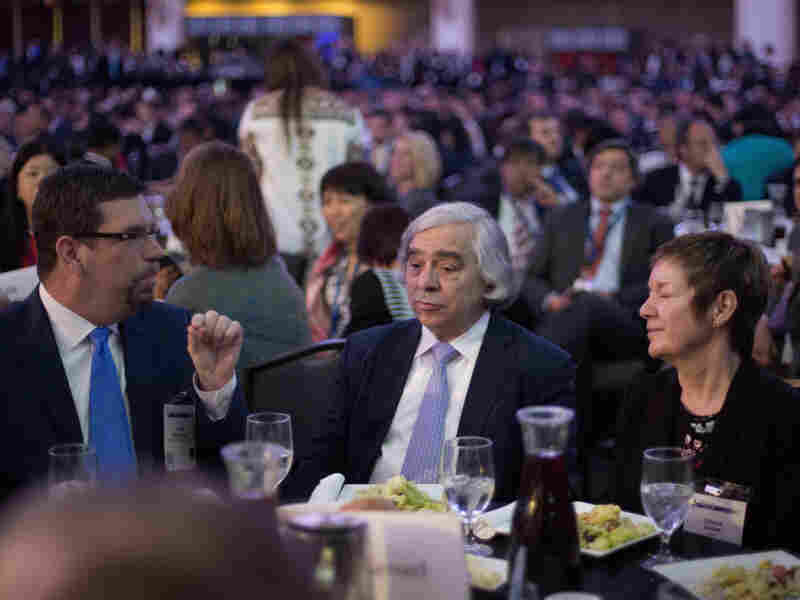 Energy Secretary Ernest Moniz (center) sits with other guests at the SelectUSA Investment Summit in Washington on Monday. Overwhelmingly, U.S. business leaders are pulling for the U.K. to remain. They fear such a big change might derail the U.K. economy and unravel the EU. It's easier to do business with a single, large economic entity, rather than cope with 28 different sets of rules spread over a half-billion Europeans. Such concerns were floating in the air this week in Washington, D.C., as British investors met with state economic teams attending the two-day SelectUSA Investment Summit, sponsored by the U.S. Commerce Department. The annual event works like a speed-dating party. Each state tries its best to catch the eye of potential foreign suitors strolling the exhibit floor of the Washington Hilton. Americans working in those booths hand out brochures (and let's be honest: candy) to attract visitors, who represent 70 foreign markets. They have good reason to work hard. Last year, this country saw a record $348 billion in foreign direct investment. California: Brian Peck said his state's business leaders would rather see the U.K. stay in the EU "for the stability of it." If the U.K. votes to leave, "it could have a domino effect on Europe," creating regulatory chaos. South Carolina: Jeremy Cauthen noted that in recent years, BMW and Volvo — both European manufacturers — have chosen South Carolina as the place to build vehicles. He didn't want to take sides on Brexit specifically, but said, "We do everything we can to attract investments" — and it helps when European companies are prosperous and looking to expand. Colorado: Stephanie Dybsky said her state's smaller businesses are not paying much attention to Brexit, but larger companies are. "A number of big companies have offices in the U.K. because it gives them access to the whole European market," she said. If the U.K. were to leave the EU, then those Colorado companies would face tough decisions about moving operations from the U.K. to the continent. Idaho: Shawn Barigar had a different take. He noted that while Brexit might well hurt the U.K. economy, there might be some upsides for the United States. If uncertainty spreads from an unraveling of the EU, then investors "might look to the United States for stability. We don't take wild swings, so it might create some investment opportunities." The latest polls in Britain suggest Thursday's Brexit vote is still too close to call. And if you're the betting kind, then Ladbrokes' latest odds show 3 to 1 against exiting the EU. Maybe we should have checked in with the Nevada booth to place bets.